Well, of all the crazy things I have ever seen, this may take the cake. A bleeding glacier? The source of that water is an intensely salty lake trapped beneath 1,300 feet of ice, and a new study has now found that microbes have carved out a niche for themselves in that inhospitable environment, living on sulfur and iron compounds. The bacteria colony has been isolated there for about 1.5 million years, researchers say, ever since the glacier rolled over the lake and created a cold, dark, oxygen-poor ecosystem. 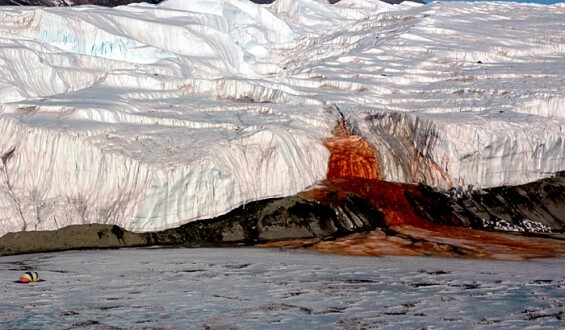 Even weirder: scientists think that the bacteria responsible for Blood Falls might be an Earth-bound approximation of the kind of alien life that might exist elsewhere in the solar system, like beneath the polar ice caps of Mars and Europa. Friday's Links: This Week...On Monday! Procrastinating? Here are 4 ways to fix it.